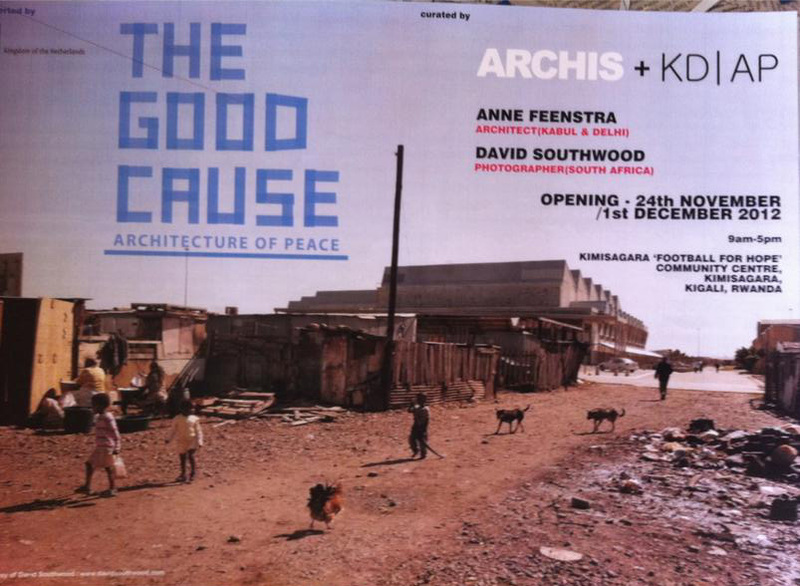 THE GOOD CAUSE - Architecture of Peace Exhibit - OPENING 24th NOVEMBER at 7pm - Closing 1st DECEMBER 2012. KIMISAGARA, 'FOOTBALL FOR HOPE’ COMMUNITY CENTRE, KIMISAGARA, KIGALI, RWANDA (Opening hours 9am-5pm). Click link to be taken to Google Maps for directions. ‘The Good Cause’ shows the thin line between architecture of war and architecture of peace. It shows the complexities of a post-conflict resolution but also gives clues how architecture can contribute to a sustainable peace. The exhibition can be seen as an instalment in a long-term project with the aim to better the way the world deals with international peace keeping and reconstruction. On the opening night there will be short talks by Lilet Breddels from Archis, Architect Anne Feenstraand South African Photographer, David Southwood. ‘The Good Cause’ is the second exhibition made as part of the Architecture of Peace project. The first exhibition took place in September 2011 at the Canadian Centre of Architecture (CCA), Montreal. This exhibition was conceived by Archis, Amsterdam and organized by the Netherlands Architecture Institute (Nai), Rotterdam, in collaboration with the Canadian Centre for Architecture, and brought to Rwanda by KD|AP. This presentation was co-organized with Killian Doherty (KD|AP) , made possible with the help of Denis Guzzo and Esperance supported by the Kingdom of the Netherlands. KD|AP (Killian Doherty /Architectural Practice) is a Design, Research and Curatory studio focusing on critical community driven issues relating to housing and the city. KD|AP designed and constructed the Esperance Football For Hope Community centre, in conjunction with Architecture for Humanity. Anne is a Dutch architect living and working in Kabul, Afghanistan. He is owner of AFIR Architects and related to Kabul University. Anne is the local representative of CIE in Afghanistan and works with his team on the renovation of the National Museum and manages the renovation of the Bagh-e-Jahan nama Palacein Khulm. Dave Southwood is a self-taught photographer whose photographic works are exhibited at The South African National Gallery, The Finnish Museum of Photography, The Christoph Merian Stiftung, The Spier Art Collection and private collections in South Africa and abroad. Three of his short films on architecture were shown at the Venice Biennale of Architecture in 2010. He has worked in many African countries with a focus on cities. Based in Kigali, Rwanda, Espérance uses football as a tool to promote peace and gender equality, to raise awareness about HIV/AIDS, and to teach young people about conflict resolution, transformation and reconciliation in a society that is still recovering from the genocide in 1994.Espérance’s Football Amahoro (Football for Peace) tournaments are played according to special football rules that facilitate peaceful conflict resolution through dialogue. The organisation’s Football Forum Theatre combines Football Amahoro and theatre on the pitch. Players are also actors and present a specific conflict or social issue, allowing the spectators to contribute to the play, providing feedback and solutions to the presented conflicts. Participants are not just educated; they are trained to be educators themselves, thus encouraging young people to take responsibility for their own actions and to become role models in their communities. Espérance has been a street football world network member since 2002 and was selected as a Centre Host in Rwanda for the „Football for Hope 20 Centres for 2010“ campaign.